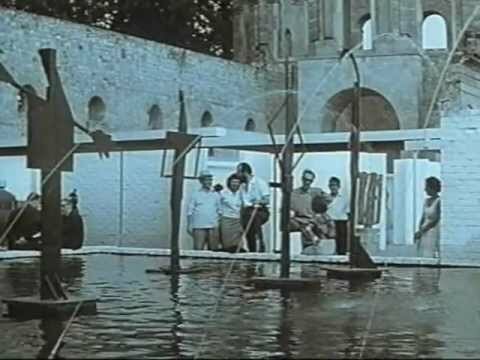 “In Kassel begann der Kunstsommer,” a newsreel film from 1959 announced, and immediately characterized the documenta II exhibition as a “labyrinth of modern art,” where “it is up to oneself to find a way through contemporary art.” The combination of modernist complexity and a spectacular show—the newsreel depicted it as a social event accompanied by light jazz music, where a young crowd dip their feet in the basin of the Picasso sculpture Les Baigneurs (1956)—was the success formula of the most iconic exhibition in postwar Europe: documenta, founded in Kassel in 1955. The period newsreel is but one example of how the image of the labyrinth was frequently used to represent documenta, especially during its second installment in 1959. Fig. 1. Still from newsreel film on documenta II. UFA Wochenschau 155/1959, July 14, 1959, Bundesarchiv, Filmothek. The labyrinthine has been identified as a curatorial model behind artist-curated exhibitions that are based on total installations in a ludic, neo-Dada vein, such as Dylaby (1962) and HON – en katedral (1966). But the announcement of the labyrinth just a few years earlier with documenta is an overlooked aspect of the exhibition histories of the era. As such, the labyrinth in this case can lead to an expanded understanding of the otherwise well-documented documenta and its double identity as authoritative institution associated with rational documentation and curatorial Gesamtkunstwerk in itself. That is, documenta as a labyrinth between institution and anti-institution that leads to the highly labyrinthine understanding of “the modern,” and even “the contemporary,” in the postwar era. Using the theme of the labyrinth in documenta II, I will suggest a trajectory around the labyrinthine in the postwar era—from the postwar restoration of modern art to 1968. I will focus on Werner Haftmann (1912–1999), co-curator and “chief ideologist” of documenta, and his ideas of modern art, which dominated the period and its development of new exhibition formats. In the combined analysis of two different temporal exhibitions and the inauguration of a new museum, I hope to illuminate the interplay of the themed, curated exhibition of contemporary art and new art institutions oriented towards the contemporary, and how curatorial models were proposed and exchanged, including the labyrinthine conception of the postwar present. The following analysis will focus on the character of exhibitions as expressions of the contemporary condition: both as popular events in their time, aimed at gaining recognition in an era where modern art was brought to fore in the scene, and as reflexive interpretations of their contemporaneity in a context characterized by new beginnings and latency, or, in the words of Haftmann: utopian futures and contemporary fears. Corresponding with the preferred aesthetic of the time, the notions of the labyrinth and the characteristics of the labyrinthine are rather abstract and appear as metaphorical topos more than as a concrete motif. According to Hermann Kern (1941–1985), who has documented the cultural history of the labyrinth in writings and curatorial projects, the labyrinth has emerged since prehistoric times in three forms: as a literary motif of a difficult, unclear, and confusing situation, as a pattern of movement in a ritual dance, and as a graphic figure. Where ancient societies saw and reflected themselves in collectively produced labyrinths where a path is followed ritualistically, the maze with its individual choices attracts the modern mind as a “profane, modern incarnation and as the ‘breaking open’ of the closed labyrinth image.” Indeed, the postwar era was obsessed with closed rooms and the possibility of breaking out of them, as we shall see. Exhibitions of the past are a complex matter to study, since they are characterized by the contrast of the presence of the show and the obvious absence after their closure. In the case of documenta, reception has been substantial in the form of critical scholarship and reconstructive renditions, not to mention the persistent reflection on the curating of the contemporary spurred by the exhibition’s current editions. The Darmstadt exhibition Zeugnisse der Angst in der Modernen Kunst is almost completely absent in the literature, despite the initial success of the exhibition and the central position of the Darmstädter Gespräche. Neue Nationalgalerie is famous in the history of architecture as Mies van der Rohe’s late work, but has not been brought substantially into the discussions on the curatorial visions of the 1960s or the new art historical focus on institutions and exhibitions (as of 2018 the museum is under restoration and will open again in 2020). These cases reveal that the art history of exhibitions remains highly selective, and this includes the emerging field of exhibition histories. Documenta developed as a conglomerate of many influences and actors. Like any other exhibition, it was the product of a specific time, geographical situation, local interests, and art world mechanisms; its success formed the impression of being at the right moment at the right time—a momentum that it has upheld since. The title itself signaled a certain special status. As documenta historian Harald Kimpel deduces, to the authoritative “Dokument” was added an “a” for a better, more modern sound, a “c” to give a certain intellectual flair and international feel, and the contemporary use of the lowercase letter was somewhat sound with the neologisms of the consumer society. The image it projected was all modern, and conscious of its new appearance. 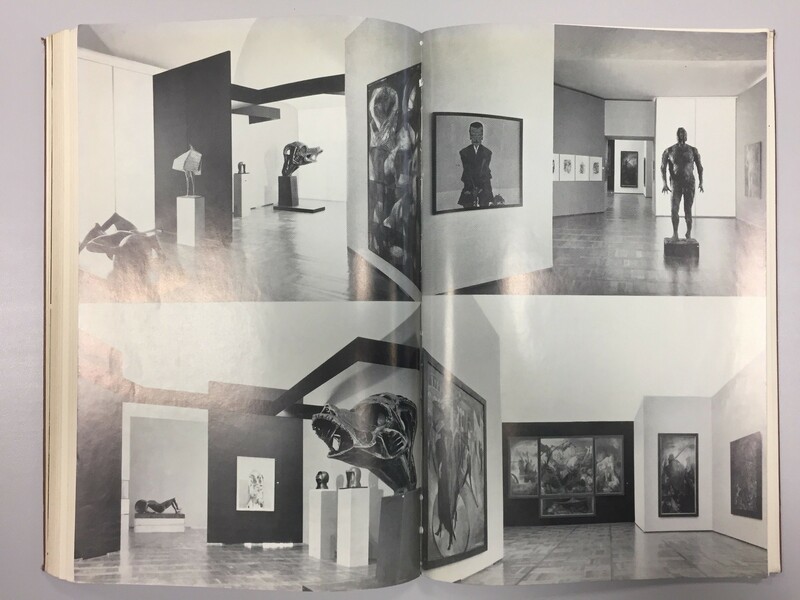 The vision of the first edition initiated by Arnold Bode, together with Haftmann, among others, was to create the first international exhibition of modern art in Germany since 1927, as Haftmann declared in the catalogue. This was a clear corrective to the persecution of modern art during the reign of National Socialism. This Gegenwartsbewältigung, which implies the active mastering of the present as well as the more distanced critical reaction, is a productive way to understand the documenta as well as the general launching of new curatorial visions of the era. In the thinking of Haftmann, who acted as art historical authority and chief ideologist of the exhibition, abstraction was tied to the modern experience and its new scientific and philosophical horizons. Perspectival painting simply was not compatible with the modern worldview and the new depths of the contemporary nature and world cognition, as he wrote in the catalogue text. Besides this connection to the more scientific worldview, abstraction was also set in a “spiritual adventure” characterized by new freedoms: “Modern culture is a very complex adventure, switching between the negative and positive poles of freedom.” As such, the documenta became a clear illustration of this spiritual adventure with its labyrinthine properties. Fig. 2. 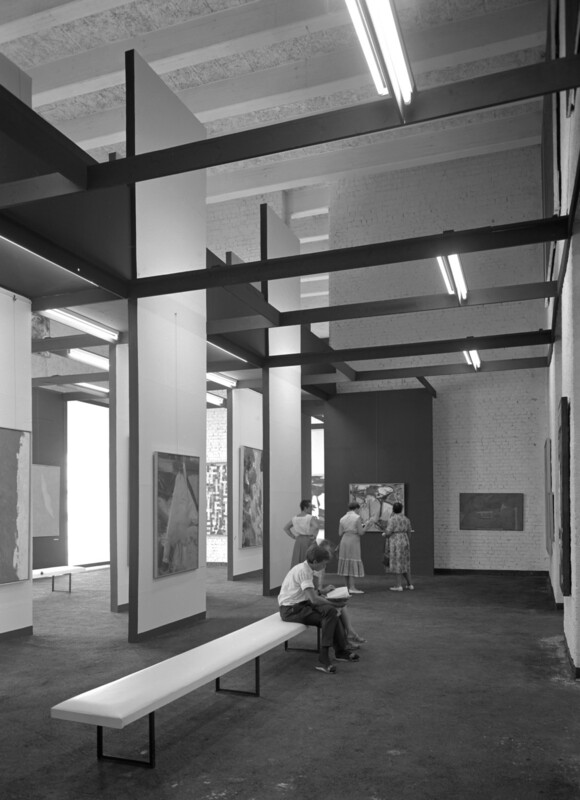 Exhibition view of Room 19 in Museum Fridericianum, documenta II, 1959. © documenta archiv/Günther Becker. The labyrinthine route through the Fridericianum ended on the top level, under the roof, where small loft spaces with a system of walls presented a hanging of the youngest artists. In an affirmative reading this could be described as “a highpoint of a labyrinthine staging of contemporary art, where factual information, physical immersion and emotional overwhelming alternated,” even if some commentators also saw this top-floor hanging as a way to stow away some of the younger artists. Fig. 3. 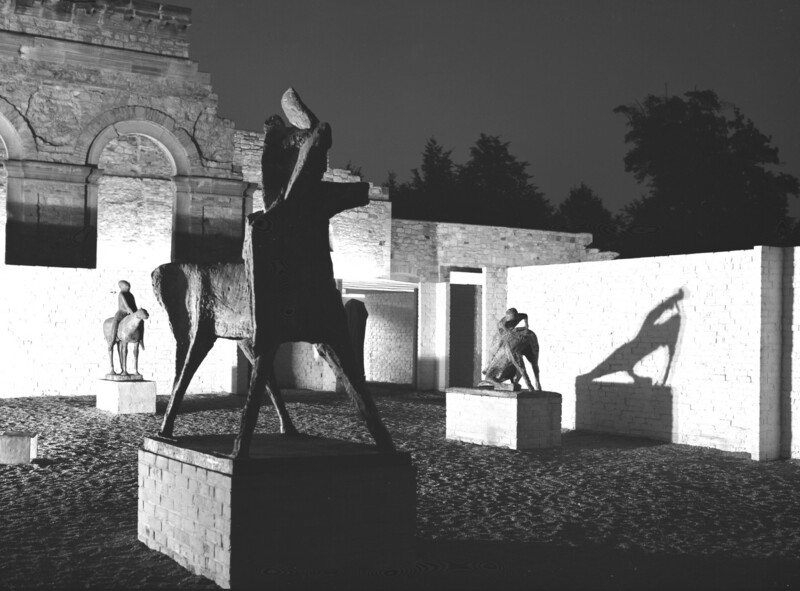 The sculpture exhibition in the Orangerie illuminated by night, documenta II, 1959. © documenta Archiv/Günther Becker. The most obvious staging of the labyrinthine was possibly the sculpture exhibition in the ruins of the Orangerie, which formed its own labyrinth, effectively composed by the old sooted ruins and the new rectangular white walls. According to Kimpel and Stengel, this created an “Open-Air-Labyrinth,” where “the white brick walls created a rhythm over the surface to a varied structure of narrow cells and passages, of fragmented spaces and opened presentation situations with long axes for the gaze, surprisingly blocked perspectives and widening planes.” This famous curatorial staging was described by Grasskamp as “open-air white cubes,” in an attempt to imbue modernism and its preferred exhibition space everywhere, but was also part of the labyrinthine adventure where the sculptural works can be encountered as Minotaurs around the corners. The labyrinth that appeared at documenta II was a meeting between clarity and chaos in a crystalized rendition of the era’s structure of feeling between new, expanding horizons and overwhelming threats. If abstraction was taken as a “world language” of the contemporary world, this world was not yet perceived as clearly defined and easily accessible, but as a complex labyrinth. The exhibition design expressed this in the spectacular setting of the ruins of the Orangerie and the white walls, and the monumental hanging of giant canvasses by Matta, Nay, and Pollock, creating both a labyrinthine environment and modernist mastery. As documenta achieved a position as an exhibition event with a special authority of and appeal to the contemporary condition, similar aims were pursued elsewhere amidst the backdrop of the postwar period, with art exhibitions that were both contenders and connections to the documenta. One such case is the exhibitions and meeting held in Darmstadt from 1950 to 1975 as Darmstädter Gespräche. The first edition was held in 1950, under the title Das Menschbild in Unserer Zeit (The Image of Man in Our Time), and took art as a point of departure spurred by two events. Firstly, its questioning of the representation of man and his world in art was inspired by art historian Hans Sedlmayr’s critique of abstraction as a dehumanizing spiritual loss, as expressed in his book Verlust der Mitte (Loss of Centre, 1948). This text was itself a labyrinthine motif in the ancient sense, where the labyrinth is a way into the center of a circle. In this cultural climate, the conservative Sedlmayr represented a contrast to the advocates of modernism, like Haftmann and the artist Willi Baumeister, whose book Das Unbekannte in der Kunst (The Unknown in Art, 1947) presented modernism as a spiritual answer to the modern world, which was close to Haftmann’s adventure for the spirit. Secondly, the discussions, which featured Theodor W. Adorno, Baumeister, and Sedlmayr (Haftmann was invited but not able to participate) in “the first major art history conference in postwar West Germany” took current inspiration from the exhibition of the Darmstädter Neue Sezession corresponding with the talks. This was a presentation of the human figure in contemporary art with a focus on abstraction, which was received as controversially modern. The following editions of Darmstädter Gespräche included Mensch und Raum (1951), led by the architect Otto Bartning and featuring Martin Heidegger, Mensch und Technik (1952), and Angst und Hoffnung Unserer Zeit (1963) with the complimentary exhibition Zeugnisse der Angst in der modernen Kunst. As the most ambitious initiative, this exhibition was to cover one hundred years of art in one hundred fifty works relating to the theme of fear and its reactions. Like Bode’s documenta (Bode was a Kassel-based artist and designer), it was curated by a local artist, Bernd Krimmel (b. 1926), supported by an advisory committee featuring Haftmann alongside Werner Hoffmann of Vienna’s Museum des 20. Jahrhundert, Willem Sandberg of the Stedelijk Museum, and Peter Selz of MoMA. To be sure, this was a network of key protagonists in the transnational movement of curating modern art at that moment. The curatorial vision was to “put our own angst into question. …Thus the works must be of our time. We can expand the space of time to our century but no further back,” as stated in the foreword of the catalogue—a focus very similar to the “Art of the 20th Century” concept of the first documenta and the new museums of modern art. Fig. 4. Views of Zeugnisse der Angst in der Modernen Kunst. Page spread from Karl Schlechta (ed. ), Angst und Hoffnung in unserer Zeit (Darmstadt: Neue Darmstädter Verlagsanstalt, 1965), 173–174. Photo: Kristian Handberg. This precise articulation of the postwar sensibility—between futuristic projections and Cold War angst—leads the way into the exhibition. If documenta was a celebration of abstraction as a world language and a corrective to the Nazi oppression of modernism, even if staged as a labyrinthine adventure, Zeugnisse der Angst in der modernen Kunst was a darker, less expansive kind of Gegenwartsbewältigung. In the introduction to the meeting, it was expressed that the present was not characterized by future optimism (this was only found in the totalitarian East) and stood in the shadows of a Nazi past motivated by “too much fear and too much hope.” Within this context, it would be appropriate to characterize the exhibition as labyrinthine. The setting was the ornate Jugendstil complex of Mathildenhöhe, built as an exhibition venue for the Darmstadt Artist Colony in 1908. The exhibition was set up in four halls, each one of irregular proportions that gave the impression of a maze. Fig. 5. Floor plan of the first hall, exhibition catalogue, 115. Photo: Kristian Handberg. The disposition of artworks presented a journey through symbolism, expressionism, and surrealism, and was dominated by more figurative strains of modern art. This differentiated the show from the more abstract focus in the historical surveys in the first documenta exhibitions. 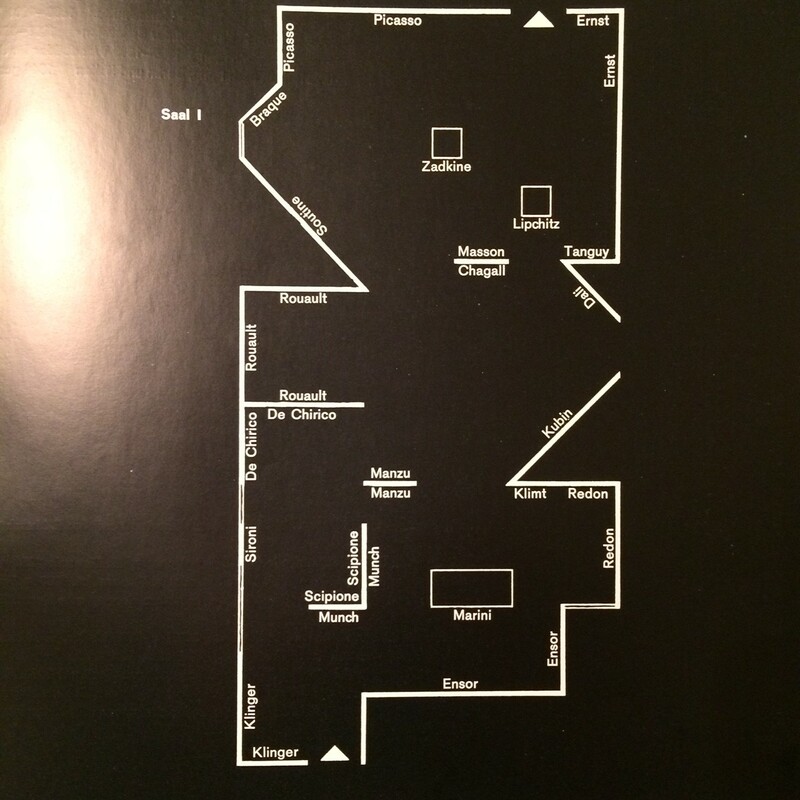 The floor plan and exhibition photos show irregular rooms and surprising juxtapositions of the works. The first hall featured Max Klinger, Edvard Munch, James Ensor, and Odilon Redon, together with Picasso and Ernst, thus representing the range from symbolism to surrealism. The second hall was dedicated to expressionism, while the third, in an oblong, sequenced structure, showed works depicting the human figure, from Kokoschka and Schiele, to Bacon and Moore. The fourth hall had a predominantly contemporary focus, showing Giacometti, Dubuffet, Matta, and Jorn, and concluded with Pollock. Apart from possibly Umberto Mastroianni’s sculpture Hiroshima (1958), the direct reference to the contemporary threats was avoided in the contemporary section by following the high modernist preference for the non-referential. Instead of an established art historical order or a sober overview, the exhibition seems to have offered a meandering path through the nocturnal side of modern art, with a labyrinthine diagnosis of the present as well as the past as difficult, unclear, and confusing. If Zeugnisse der Angst in der modernen Kunst did not match the all-encompassing documentation of contemporary art that documenta was claiming, it should be seen as an important exhibition in the era’s self-definition of the contemporary condition and in the struggle between alternative locations vying for importance in the new geography of art. The powerful network of contributors crowned by Haftmann testified to this ambition. It was recognized as a significant exhibition nationwide, as expressed in a review in Die Welt, which declared Darmstadt a wunderkind of young culture that initiated one magnificent spiritual-artistic initiate after the other. This prominence has not been maintained, as the importance of the Darmstadt meetings was seemingly waning with the entertainment culture of the Wirtschaftswunder and emergence of prestigious new museums in the bigger cities. The 1963 exhibition stands as an example of the attempts to develop ambitious curatorial presentations in non-established forms, taking up a special dialogue with the present. It was the labyrinthine that was a viable characteristic of the exhibition, with its spatial structuring in the Jugendstil complex, its vast presentation of twentieth-century art, and, not least, its illustration of a contemporaneously typical stimmung of existential complexity between utopia and angst—all making it an “adventure for the mind” in the labyrinth of art and with plenty of fear-inducing Minotaurs, to paraphrase Haftmann’s words on the documenta. Neue Nationalgalerie: the final modernist labyrinth? The most prominent new museum building was inaugurated in the midst of the notorious year of 1968 (in itself a labyrinth of new roads and blind ways, utopias and fears) as the last work of Mies van der Rohe (1886–1969). The setting of the Neue Nationalgalerie in West Berlin was arguably the most labyrinthine place of them all in the era, easy to associate with walls and no exits. In his essays on the architectural configuration of Berlin, entitled Berliner Labyrinth (1993), Tilmann Buddensieg has viewed the order of the Neue Nationalgalerie as a “harmonious contrast” delimited by the terrace walls to the surrounding world of the labyrinthine city outside. Fig. 6. 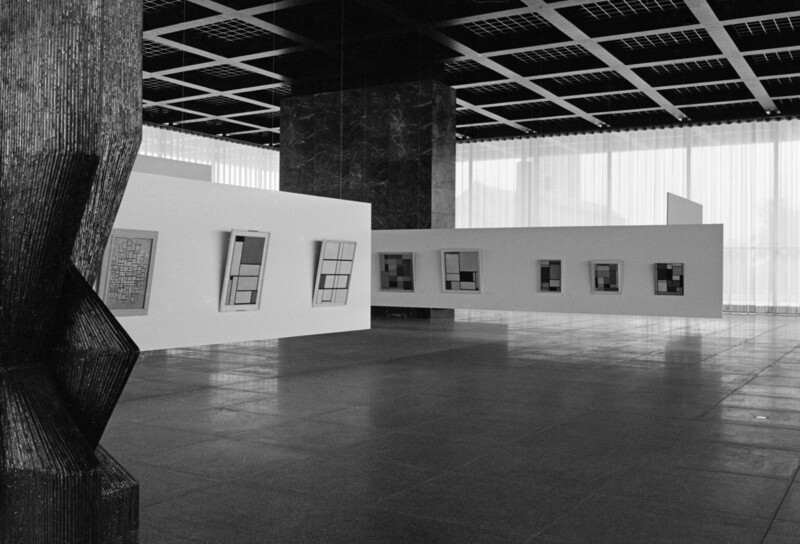 Exhibition view of Piet Mondrian, Neue Nationalgalerie 1968. © Staatliche Museen zu Berlin, Zentralarchiv/Reinhard Friedrich. The experimental totality of the exhibition space, which exceeded the conventional proportions of the gallery space, made an overwhelming impression on the contemporary viewer, who often experienced it all as a total work of art. “The steel and glass hall of Mies van der Rohe is in its formal fulfillment so exclusive… that the oakwood hatstands appear as unfamiliar,” wrote one reviewer. The building presented itself as an autonomous artwork and a monument to modernism, rather than as a functioning museum machine, as Buddensieg has stated. The temple- or cathedral-like pretention of the work gave it, in some sense, the cult-like function of the ancient labyrinth, or at least the uncompromised license to create a design of modern art’s self-understanding. Mies himself stated that architecture was “not a play with forms,” but should be the driving force of civilization, and was able to be an expression of the innermost structure of its time: a statement proclaiming the role of Gegenwartsbewältigung for architecture. According to architecture historian Detlef Mertins in his analysis of the “well-known but under-examined” Nationalgalerie, Mies “transformed technology into an architectural image that was at once technological, artistic, historical and cosmological. This image provides a stage—almost transparent—on which the homelessness and nihilism so central to the experience of modernity can be enacted as both a crisis and an opportunity for constructive self-fashioning.” This was a drama reminiscent of the ones staged in Kassel and Darmstadt. Fig. 7. 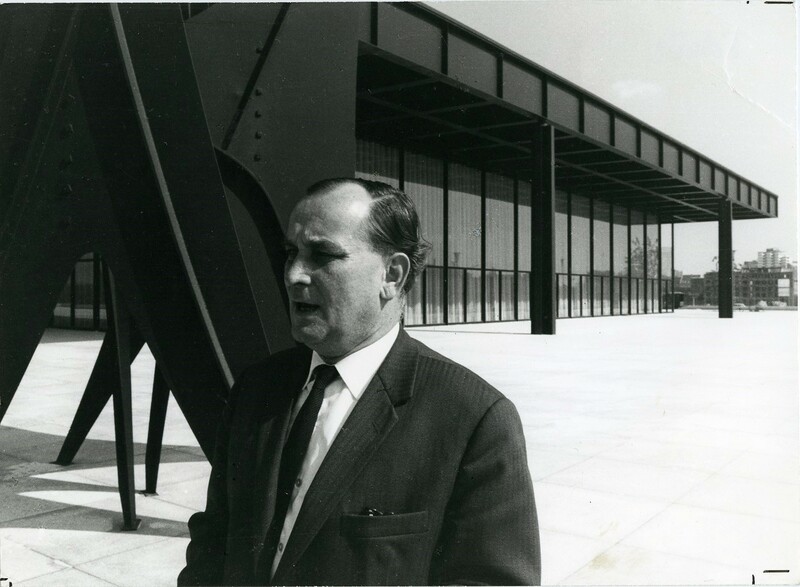 Werner Haftmann in front of Neue Nationalgalerie, Berlin, 1968. Photo: Reinhard Friedrich, Zentralarchiv, SMB. If the exhibition is an immanent rendition of the contemporary condition, this contemporaneity must be commented upon. Hans Ulrich Gumbrecht’s After 1945 (2013) makes just such an attempt, by identifying the feeling in Germany after World War II. He locates the ambivalent mood of the years after 1945 in three topoi recurring in the cultural production and thinking of the era: “No Exit and No Entry,” “Bad Faith / Interrogations,” and “Derailment / Containers.” The combined effects of these three configurations would, according to Gumbrecht, be called “a ‘labyrinth’ or a ‘maze.’” This “labyrinth produced both a desire for departure and, at the same time, the fear that such a departure would entail departure from earth,” and was characterized by a circularity as it had no “clear-cut goals one might achieve—or even points of departure.” Gumbrecht, a literary scholar, does not include exhibitions among his examples (Pollock is included as the only visual artist), but as this essay may indicate, the new exhibitions of modern art appeared as expressions of a related labyrinthine modern in the cultural landscape. Between contemporary fears and utopian futures, it was up to oneself to find a way through the labyrinth of modern art. In a certain sense the exhibition initiatives from the first documenta up to the realization of the new national gallery expressed the desire for a new beginning, overcoming the Nazi views on art and restoring modernism as a foundation for the contemporary (with the concurrent aim to contest the socialist realism of Eastern Europe); a role that obviously breaks with the silenced “new quiet world” of the post-1945 decade. In such a reading the labyrinth actually leads somewhere, different from the “No Entry and No Exit” motif. However, the keynote of the works exhibited and the rhetoric surrounding them was rather that of an immanent one, as in Parker’s characterization of Pollock previously cited, which makes the labyrinths even more complex. From the analysis of the three cases it can be concluded that the “labyrinth of modern art” was a frequently circulated term and a conglomerate of central discourses in the era’s art historical articulation of the modern and the contemporary. This is most evident in the case of documenta, with its takeover of the ruined Fridericianum, where later editions, like Harald Szeemann’s very different documenta V in 1972, would have been an interesting addition. However, it is also important to compare with the less-remembered events, like the Darmstadt exhibition, to show the potentialities of this seminal era in modern exhibition-making and draw parallels the newly built environments like Neue Nationalgalerie, which might test the reach of the concept labyrinthine, but also relate to the ideas about modern art and its presentation. The labyrinth of modern art was both an expression of the cultural situation and a way to break free of it—a condition that has also followed posterity’s curatorial labyrinths. Kristian Handberg works as a postdoc at the Louisiana Museum of Modern Art and the University of Copenhagen with the project Multiple Modernities: World Images and Dreamworlds in arts and culture, 1946–1972 (2015–2018), as well as the new project Curating the Contemporary (2019–). He defended his PhD thesis, “There’s no time like the past: Retro between Memory and Materiality in Contemporary Culture,” in 2014 at the University of Copenhagen. He is also the coordinator of the research group Modernisms, through which he investigates exhibition histories of the postwar era and the contemporary musealization of modernism. Handberg also organized the conference “Multiple Modernisms: A symposium on globalism in postwar art” at the Louisiana Museum of Modern Art in 2017. UFA Wochenshcau 155/1959, July 14, 1959, Bundesarchiv, Filmothek, accessed February 2018, https://www.filmothek.bundesarchiv.de/video/584345. Lose Yourself! Symposium on Labyrinthine Exhibitions as Curatorial Model, Stedelijk Museum Amsterdam, February 3–4, 2017 (https://www.stedelijk.nl/en/events/lose-yourself-2), and this edition of Stedelijk Studies. Hermann Kern, Through the Labyrinth: Designs and Meanings over 5000 Years, rev. ed. (1982; repr., Munich: Prestel Verlag, 2000), 27. Harald Kimpel, documenta. Die Überschau (Cologne: DuMont Verlag, 2002), 4. This slogan is associated with Werner Haftmann, even if the term itself stems from other sources, like Georg Poensgen and Leopold Zahn, Abstract Art – A World Language, 1958. See Walter Grasskamp, “Becoming Global: From Eurocentrism to North-Atlantic Feedback – documenta as ‘international exhibition’ 1955–1972,” On Curating: The Documenta Issue, no. 33 (2017). Grasskamp, “Becoming Global: From Eurocentrism to North-Atlantic Feedback,” 108. Knud W. Jensen, “Indtryk fra Documenta II,” in Louisiana 1959, ed. Knud W. Jensen (Louisiana/Gyldendal, 1959), 61. Parker Tyler, “Jackson Pollock: The Infinite Labyrinth,” in Jackson Pollock: Interviews, Articles and Reviews, ed. Pepe Karmel (New York: The Museum of Modern Art 1998), 66. Walter Grasskamp, “The White Wall: On the prehistory of the White Cube,” On Curating, Curating Critique 9, no. 11 (2011), 88. British culturlal historian Raymond Williams introduced this concept of an era’s different ways of thinking in 1954. See Claudia Mesch, Modern Art at the Berlin Wall: Demarcating Culture in the Cold War Germanys (London: I.B. Tauris) 2009, 37–39. Stadtlexikon Darmstadt website, accessed March 2018, http://www.darmstadt-stadtlexikon.de/d/darmstaedter-gespraeche.html. 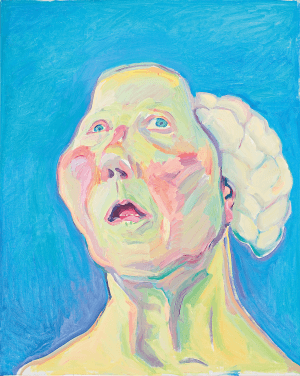 Werner Haftmann, “Utopie und Angst,” in Zeugnisse der Angst in der Modernen Kunst, exh. cat. (Darmstadt: 1963), 77–97, 87. Ibid., 80. “Utopie und Angst sind also im Bilde einer Kultur komplementäre Erscheinungen. Karl Schlechta, ed., Angst und Hoffnung in unserer Zeit (Darmstadt: 1965), 5–9. R. Krämer-Badoni in Der Welt, “Darmstadt bleibt ewig jung und ein Wunderkind … es ergreift eine grossartige geistig-künstlerische Initiative nach der anderen”, in Sabine Welsch & Klaus Wolbert (eds. ), Die Darmstädter Sezession 1919-1997. Die Kunst des 20. Jahrhunderts im Spiegel einer Künstlervereinigung, (Darmstadt: Institut Mathildenhöhe, 1997), 320. Tilmann Buddensieg, Berliner Labyrinth (Berlin: Wagenbach, 1993), 115. Spandauer Volksblatt, September 15, 1968, and Hamburger Abendblatt, September 16, 1968. Rosalind Krauss, “The Grid, The /Cloud/, and The Detail,” in The Presence of Mies, ed. Detlef Mertens (New York: Princeton Architectural Press, 1996), 111. Detlef Mertens, “Mies’s New National Gallery: Empty and Full,” in What Makes a Great Exhibition?, ed. Paula Marincola (London: Reaktion Books, 2007), 85. Walter Grasskamp, “The White Wall – On the Prehistory of the ‘White Cube,” 85. “Das Ehlend der Nationalgalerie,” Frankfurter Rundschau, September 15, 1970. Hans Ulrich Gumbrecht, After 1945: Latency as origin of the present (Stanford: Stanford University Press, 2013), 154.